Preheat a skillet or griddle over a medium flame, or warm an electric skillet to 350°F. In a medium bowl (or a one-quart measure), whisk together the almond milk, egg, oil and vanilla. Add the wet ingredients to the dry, and beat them with the wire whisk just to combine. There should still be a few lumps in the batter. Ladle, by the quarter-cupful, the batter onto the hot surface. 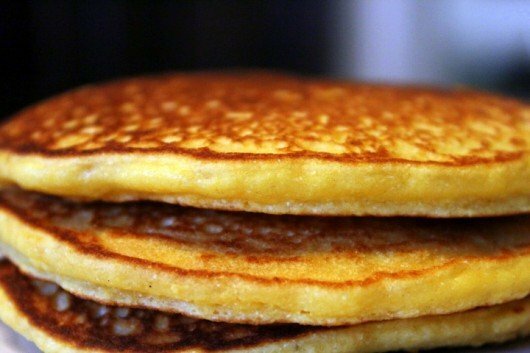 When air bubbles appear along the edge of the pancakes, flip them over, and brown the other side. If you are not going to serve the pancakes right away, keep them warm on a cookie sheet in a 200°F oven.